The declaration of the Indigenous People of Biafra (IPOB) as a terrorist group and its proscription by the Federal Government may not have had any significant impact as members of the Biafra agitation group have said they are more united than ever to actualize the state of Biafra. Sunday Sun investigations showed that though IPOB members may have removed their insignias and other paraphernalia from open display, they have not in the least been broken or given up their quest. Rather, the group has gone underground but growing in membership. An IPOB member who simply gave his name as Eze said members of the group remain in high spirit even without Nnamdi Kanu being around. He revealed that IPOB is expanding by the day notwithstanding their leader’s whereabouts being unknown. “We are absolutely in high spirit; we are having our meetings as usual and will continue to have them, to strategise. In fact, new families and zones are being opened. Last weekend, we opened nine zones in Aba South Local Government Area alone and new members are being registered. The Nigerian government is popularizing IPOB; and let me tell you something, Nnamdi Kanu’s absence is as good as his presence because before now he gave us a message which we accepted and there is no going back on Biafra,” he enthused. Eze stated that IPOB hierarchy is still intact, explaining that why it appeared that the group is not being heard now is because they are mourning and burying their members killed by the military. He promised the group would be back after the days of mourning are over. “What we are doing now is to mourn and bury the dead which we are doing one after the other and also to take care of the wounded after which we will bounce back. 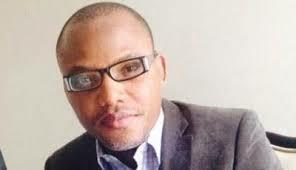 Whether Nnamdi Kanu is there or not, the agitation must go on. Eze said if not for their members that were killed, they would not have been annoyed over all that happened, saying they would have been surprised if the Nigerian Army did not do what it did. Prior to these developments, there had been apprehension in some quarters since September 18, when the military invaded the home of IPOB leader, Nnamdi Kanu, at Afara Ukwu, Umuahia, Abia State and his whereabouts has remained unknown. It had been thought in some quarters that the undetermined status of Kanu and the exercise carried out by the military to disperse hordes of members of the group would have left them in confusion, disarray and dilemma. Notwithstanding the uncertainty surrounding their leader’s status, Sunday Sun learnt that the issue of Biafra had become spiritual and could not be overcome by military force, and that no human being can stop it whether their leader was around or not. A female IPOB member, Kate, said two of her sons were among the new members that were registered last week, stressing that no amount of killings will stop the agitation. “The dead have given us more strength, let them buy more tanks and guns because they will kill more Biafrans,” she declared with a fierce look on her face. She was emphatic that the organizational structure of IPOB is very much intact, stressing that Kanu’s absence does not in any way affect anything as the leadership chain has not been broken. Similarly, Prince Emma Kanu, younger brother of the IPOB leader, said despite what has happened in the last one month, the family and IPOB members are in high spirit and remain resolute in the quest for restoration of Biafra. “We cannot live in a country where one tribe determines what happens in the nation. We’ve tried Nigeria, reached the zenith of frustration and the only option is to leave Nigeria and we are pursuing it with every zeal,” he said.